After 18 months of planning and hard work I’m very pleased to announce the publication of my new illustrated children’s story, “Norwich: City of Dragons”. Written by poet and historian John Simpson Wedge, and illustrated by myself, the story follows the adventures of a young boy called Harry who whilst walking around the city, discovers dragons living in different historic and cultural buildings that his mother cannot see. The story mixes poetry with facts about the history and architecture of the buildings that Harry visits and includes well known landmarks such as Dragon Hall, Norwich Castle and Cathedral, City Hall, The Assembly House, Playhouse, Puppet Theatre, Guildhall, Royal Arcade and The Forum. Originally created for the 2014 Norwich Dragon Festival, it was so popular with families who attended that we decided to apply for funding support from the Harry Watson Bursary to make it into a printed book. Copies will soon be available to buy in all good local bookshops as well as online via the publisher Book Wyrm Books, (www.bookwyrmbooks.co.uk) priced at £4.99. 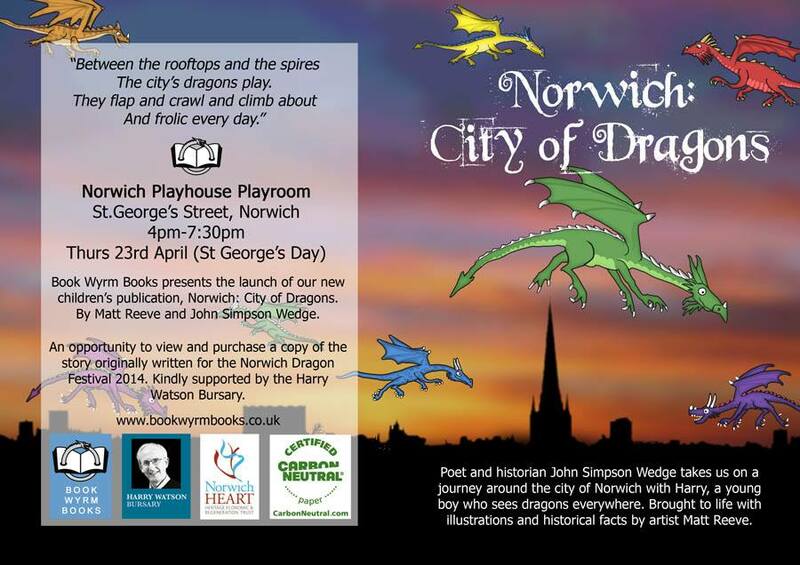 For those that wish to purchase a copy on St. Georges Day, there will be a signing event in The Playhouse Theatre on St. Georges Street, Norwich. 4pm-7:30pm.